Over 300 people gathered to pray the Rosary at Laytown Beach, Co. Meath. 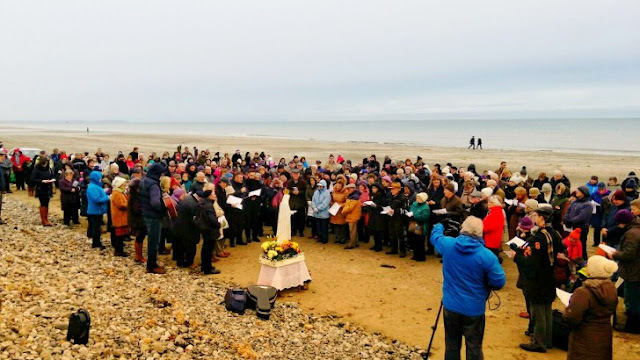 About 30,000 people gathered at almost 300 locations for last weekend’s ‘Rosary on the Coast’ initiative, organisers believe. Based on figures from groups around the country, it looks like the event was a huge success, according to pro-life campaigner and former MEP Kathy Sinnott. “Between a quarter and a third of locations sent in their estimated figures, and extrapolated from that our estimate for Ireland would be 30,000 people,” she told The Irish Catholic, explaining that Irish groups met at 295 points around the country for the pro-life prayer rally, with some locations such as nursing homes being ‘hidden locations’. The 30,000 who gathered in Ireland were joined in prayer, she said, by individuals praying in their homes all over Ireland and by individuals and groups from around the world. She has heard, she said, of groups praying at England’s Shrine of Our Lady of Walsingham, of parishes praying in Britain, and of seminarians praying in Rome’s Irish College and North American College. Spiritual support also came from Poland, she said, where Radio Maria almost daily reminded people to join in Ireland’s coastal Rosary, and from places as far afield as Japan, Nigeria, and Peru. At least six bishops were involved in the event, she said, while others gave it their blessing by allowing their cathedrals be used as locations for it. Priests around the island also participated and led groups, although it was a lay-led initiative. Describing the situation in the North as “incredibly threatening”, she said while pro-life campaigners in the North should be praised for their work, things have reached a point where only a miracle can stave off the introduction of a British-style abortion regime in the region. Pointing to the threat to the Eighth Amendment in the Republic, she also said that the prospect of euthanasia being introduced is looming in the background. She said this was “an acute problem”, as compared to the “chronic problem we’ve seen over the past 40-50 years of the fall away from practice and even adherence to the Faith”, “You don’t get miracles without asking for them,” she said.